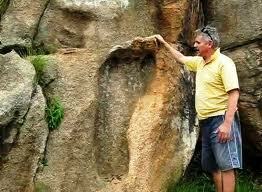 Michael Tellinger, author of Slave Species of god discusses Anunnaki, gold mines and ancient ruins in South Africa. The Anunnaki ate gold dust for longevity, spread it as an atmospheric cloaks for their homeplanet Nibiru and to this day use it to enslave us in debt. He tells how Banksters and Illuminati control Earth. Michael analyzes the spiritual implication of the Anunnaki’s genetic dumbing-down humanity. Telllinger’s findings fill gaps from Zecharia Sitchin’s studies and has clues to free energy utilization with which we can free ourselves from polluting our planet for energy and from the thrall of those who monopolize it. I knew about the gold powder for longevity this is the only place where I ever saw anybody sugest that… I thought I was I was crazy for thinking that but I believe it should be mixed with another ingredient 🙂 Best wishes , People really need to know the Truth!!! this is a very interesting website it makes sense far more interesting then the bible, the Koran, etc!